My Nova Mist breeding program is young but fully dedicated to raising healthy puppies, providing families with the best possible companions. My Goldens are health tested, both physically and genetically, and I take great care in finding and selecting compatible mates. Producing healthy, well tempered puppies while conforming to the Golden Retriever breed standard is foremost. I have participated in AKC, UKC and IABCA shows in conformation as well as experienced the joys of dock diving with my Goldens. 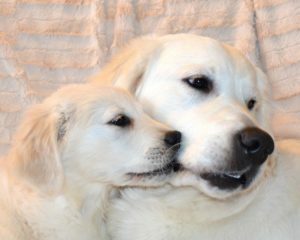 Having had the tremendous fortune of forming a long lasting friendship with Patti Covert of Acadia Golden Retrievers, my Golden dreams continue to become a reality. Patti has been my teacher and mentor for many years, encouraging me to take on new challenges while experiencing the wonders and benefit of sharing my life with my beautiful canine family.